The Seminole State College Educational Foundation recently received a $75,000 donation from the Kinslow Family and the Seminole Sonic Drive-In. The funds have been designated to help construct the new Brian Crawford Memorial Baseball and Sports Complex – a joint project between the Foundation and Seminole State College. Brooke Kinslow Case and Brett Case, along with their son Brody, presented the check on behalf of the Kinslow family during the annual Trojan Baseball Kick-Off Banquet at the College on Saturday. The Cases are both alums of Seminole State College. Brooke was a member of the Belles Basketball Team and Brett played for the Trojan Baseball Team. He was a member of the 2004 team that advanced to the JUCO World Series in Grand Junction, Colorado and finished 3rd in the nation. He later returned to serve as an Assistant Coach for the Trojans. “Members of the Kinslow family have had a long association with Seminole State College. They have been great supporters – donating to our scholarship program and sponsoring SSC Educational Foundation fund raising events and activities. We are thankful for their commitment to this exciting project,” said SSC President Lana Reynolds. Reynolds also expressed her appreciation to SSC President Emeritus Dr. Jim Utterback and former Trojan Baseball Coach Lloyd Simmons for their efforts in acquiring this donation. While becoming a namesake for late student-athlete Brian Crawford, the new baseball complex will also provide the College’s nationally-recognized baseball program with a state-of-the-art facility. It can be used to attract games and tournaments throughout the state and beyond – bringing in potential tourism dollars to local hotels, restaurants and other businesses. This complex will benefit not only the community, but also generations of young athletes for years to come. For more information about the SSC Educational Foundation and the Brian Crawford Memorial Baseball and Sports Complex, or to make a tax-deductible donation, please contact SSC President Emeritus Dr. Utterback at 405-382-9555 or Educational Foundation Advancement Coordinator Autumn Wiles at 405-382-9506. 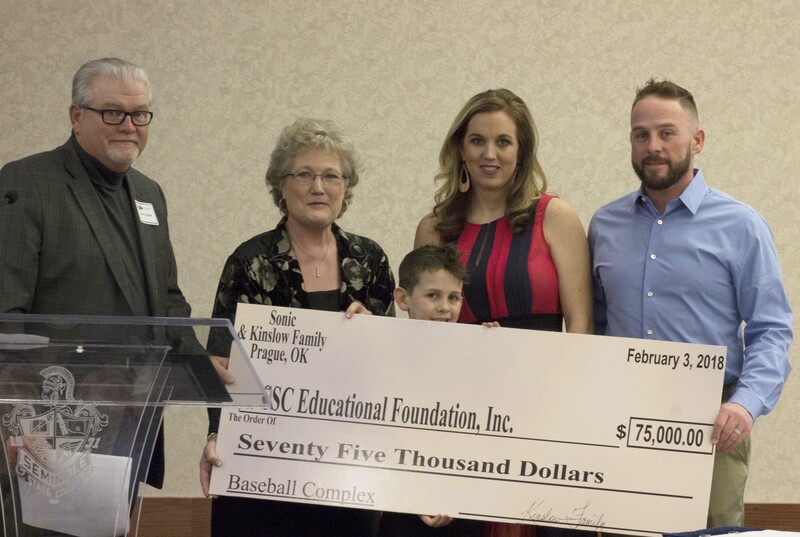 Members of the Kinslow family presented the Seminole State College Educational Foundation with a $75,000 check during the annual Trojan Baseball Kick-Off Banquet at the College on Saturday. Pictured (l-r) are: Larry Smith, SSC Director of Rural Business and Resources Center; Lana Reynolds, SSC President; Brody Case; Brooke Kinslow Case; and Brett Case.